Stimulating, advancing, and sustaining the arts in the Orono-Old Town area. 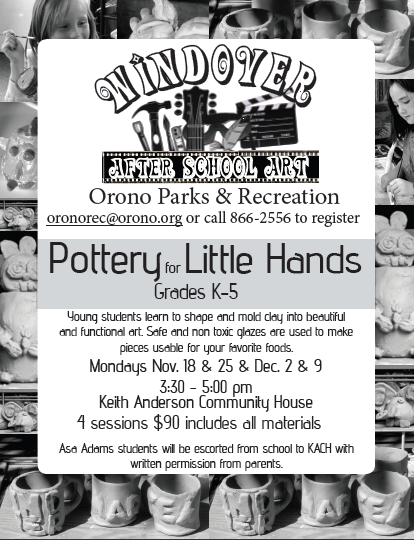 Windover Arts is offering a fantastic Pottery for Little Hands class through Orono Parks and Recreation. Check out the poster below and sign your child up today for an awesome opportunity to learn a little pottery! Come celebrate the arts in downtown Orono! The mission of Stillwater Community Arts is to stimulate, advance, and sustain the visual and performing arts in Orono, Old Town, and neighboring communities by facilitating educational and cultural opportunities that enhance access to, awareness of, collaboration in, and appreciation for the visual and performing arts.